Sometimes you need believe so you can see what others are missing in the stock market. 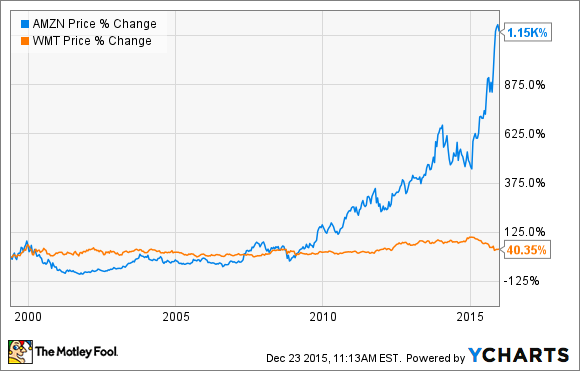 Lessons from Amazon vs. Wal-Mart and the Netflix debacle of 2011. Master Yoda is one of the most popular characters in the Star Wars saga. The legendary Jedi master is over 900 years of age, and you don't get to live that long without learning some important lessons. Whether you are trying to become a Jedi, or simply looking to make the right investments to secure your financial future, there is a lot to learn from Master Yoda. When making investment decisions, you want to be realistic and down-to-earth, but you also need to believe in great companies run by visionary leaders in order to find the best growth opportunities in the world. Seeing what others don't see requires trust and conviction, and it can make you a lot of money over the years. In May of 1999, Barron's Magazine published a long cover story about Amazon (NASDAQ:AMZN), basically saying the company was almost worthless and that investors should sell Amazon stock as soon as possible. The headline was quite eloquent: "Amazon.bomb." "Once Wal-Mart decides to go after Amazon, there's no contest," declares Kurt Barnard, president of Barnard's Retail Trend Report. "Wal-Mart has resources Amazon can't even dream about." It turns out that Amazon's first-mover advantage in online retail, the company's innovative culture, and the visionary leadership of Jeff Bezos were, and still are, major competitive strengths for the company. Amazon has materially outgrown Wal-Mart and other traditional retailers over the last several years, and Wal-Mart is now struggling to defend itself from the major competitive threat Amazon represents. In a sign of the times, Amazon is now worth more than Wal-Mart in terms of market capitalization. The online retailer has a market cap value of around $311 billion versus nearly $194 billion in market value for Wal-Mart. Needless to say, Amazon stock has obliterated Wal-Mart since the Amazon.bomb article was published. In 2011, Netflix (NASDAQ:NFLX) made the decision to split its traditional DVD rentals and online streaming businesses in order to better position the streaming segment for growth. The company also made a serious mistake that infuriated customers by raising prices too much. Because of this, Netflix lost 80,000 subscribers in the third quarter of 2011, and the stock tanked by nearly 70% over a few months. Fast-forward a few years, and Netflix is the undisputed leader in online streaming, the company has over 69 million members around the world as of the third quarter in 2015, and management calculates that it will end the full year with 74 million global members. In addition, Netflix is successfully expanding into original content, and this is a huge strength when it comes to attracting new members and retaining existing ones. The rewards for investors who were brave enough to believe in Netflix back in 2011 have been astronomical. The stock made yearly lows below $10 in December of that year, and it's now trading in the neighborhood of $116 per share. Most people go with the phrase, "I'll believe it when I see it." There is a lot to be said for a healthy dose of skepticism when analyzing investment decisions, but you sometimes need to go the other way around. You need to believe in order to see what other investors are missing. Betting that Amazon was going to succeed against Wal-Mart in 1999, or that Netflix was strong enough to recover from its mistakes in 2011 were not easy investment decisions to make in their historical context. However, investors who are willing to believe in the power of innovation and visionary human talent can get rewarded massive returns over the long term.